Justine Cassell, co-chair of the Global Future Council on Computing, recently sat down for an interview with World Economic Forum to discuss what computers will be able to accomplish by the year 2030. From light bulbs acting as fully automatic computers, to 3D printing heart tissue, Cassell discussed how the future of human-computer interaction (HCI) will affect every single industry. “Today computers are in virtually everything we touch, all day long. We still have an image of computers as being rectangular objects either on a desk, or these days in our pockets; but computers are in our cars, they’re in our thermostats, they’re in our refrigerators. In fact, increasingly computers are no longer objects at all, but they suffuse fabric and virtually every other material,” said Cassell. Every year, people like Cassell – scientists, academics and tech junkies from across the globe gather to discuss such human-computer interaction examples, at the most prestigious human-computer interaction conference in the world. This is the ACM Conference on Human Factors in Computing Systems, run by the Association for Computing Machinery, the world’s biggest educational, scientific computing society. The future of HCI has become a popular topic, with more events similar to the ACM Conference being held to discuss the potential technology withholds. We’re now imagining examples of human-computer interaction personalised to our individual needs, but just a few years back, we were imagining inventions as simple today, as the computer mouse. 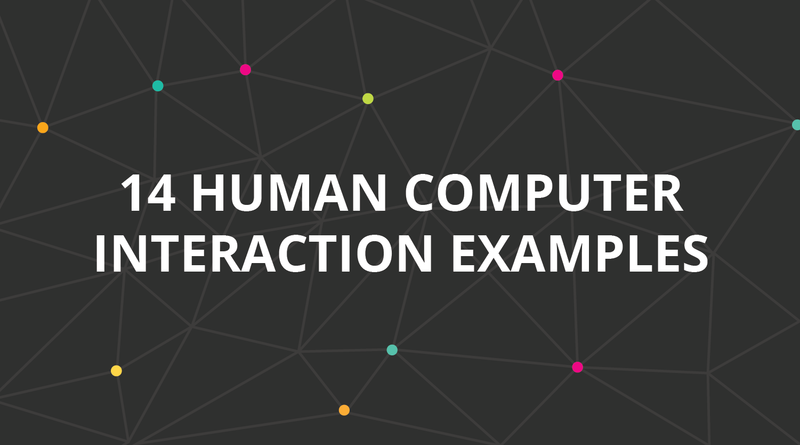 Below are 14 examples of human-computer interaction that have emerged through the years, including a few we hope to see in the future. 1 Cassell, J. (Dec, 2016). ‘By 2030, this is what computers will be able to do’. Retrieved from World Economic Forum. 2 Ji, H. (2015). ‘Investigating a Design Pattern to Support Personalized Human Computer Interaction’. Retrieved from University of Technology. 3 The Editors of Encyclopaedia Britannica. ‘Christopher Latham Sholes’. Retrieved from Brittanica. 4 Haigh, T., Priestley, P.M., Priestley, M. & Rope, C. (2016). ‘ENIAC in Action: Making and Remaking the Modern Computer’. Retrieved from Google Books. 5 Smith, E. (Oct, 2017). ‘The Scrolling Orb’. Retrieved from Tedium. 6 ‘The History of the Arcade Game Joystick’. Retrieved from Arcade Classics. 7 Sutherland, I.E. (1968). ‘A head-mounted three dimensional display’. Retrieved from CACS. 8 ‘The PLATO-IV system for computer aided instruction’. Retrieved from UvA/FNWI. 9 ‘3D Printing.’ Retrieved from Everything about 3D printing. 10 Marshall, G. (Apr, 2015). ‘Before Apple Watch: the timely history of the smartwatch.’ Retrieved from TechRadar. 11 ‘Natural user interface (NUI)’. Retrieved from WhatIs.com. 12 Wilson, M. (Oct, 2017). ‘Exclusive: Microsoft Has Stopped Manufacturing The Kinect’. Retrieved from FastCompany. 13 Damiba, B. (Sep, 2011). ’Introducing Voice Actions for Android in the UK, France, Italy, Germany and Spain’. Retrieved from GoogleMobile. 14 (2016). ‘Dexta Shows Off Latest Exoskeleton Gloves That Let You Touch VR’. Retrieved from Roadtovr. 15 Obrist, M., Velasco, C., Vi, C., Ranasinghe, N., Israr, A., Cheok, A., Spence, C. & Gopalakrishnakone, P. (Sep, 2016). ‘Sensing the future of HCI: touch, taste and smell user interfaces.’ Retrieved from Interactions. 16 Whelan, E., McDuff, D. & Gleasure, R. & vom Brocke, J. ‘How Emotion-Sensing Technology Can Reshape the Workplace’. Retrieved from MIT Sloan Management Review. 17 Stiles, K. (2018). ‘Are Flexible Display Smartphones Here To Stay?’. Retrieved from Hongkiat. 18 Ramos, D.G. (Jan, 2018). The Future of Brain Computer Interface Technology. Retrieved from in-Training. 19 Ramos, D.G. (Jan, 2018). ‘The Future of Brain Computer Interface Technology’. Retrieved from in-Training.